Omega's RTD sensors with M12 connections are designed to provide for easy and efficient installation or removal of these sensors for periodic calibration, troubleshooting or replacement. Gone are the days of having to pull extension cables from cable trays in order to calibrate or replace the sensor, now you simply disconnect the sensor from the extension cable saving cost and downtime. 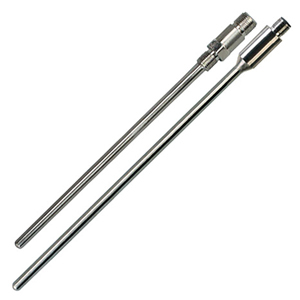 The Omega PR-26 RTD is a flexible and robust temperature sensor made with 316L Stainless Steel housings and sheaths for strength and corrosion resistance. The probe stem is made from mineral insulated cable which produces a sensor that can be used to 500°C, and can be bent (except for the first 50 mm of the tip) to fit your application. These sensors include a 4-pin, M12 A-Coded plug connector for easy assembly to patch cables or extension cables. Unlike other M12 enabled sensors that have a maximum rating of 85 or 90°C on their connections, the PR-26 RTD can really take the heat with a connector rating of 250°C. Combine this sensor with one of our proprietary M12CM-T24SSPC high temperature extension cables and you have a probe/cable combination that is unmatched in the industry. Installed directly into your product or process using an existing metric threaded port. When combined with our M12-Handle, non-threaded "A" style PR-26 probes can be used in hand-held sensing applications. Other applications using a variety of available compression fittings or other accessories. These RTD sensors can be used in any 2, 3 or 4-wire application by selecting one of the two available wiring arrangements (see the wiring diagrams below) and using only those wires needed for your measurement connection. This allows for simplified, trouble free installation with any existing application. This also allows the PR-26 series sensor to be used for a wide variety of replacement applications since it can be connected as-is with just about any measurement or control equipment available when combined with a 4-pin female M12 connector extension or patch cable. When ordering your PR-26 sensor, don't forget your extension cable. Omega offers a wide selection of extension cables including over molded PVC, Polyurethane and Silicone cables, as well as customized cables in a variety of materials with optional stainless steel braid or hose for improved mechanical protection, and a wide selection of instrument connections. Connect your PR-26 RTD sensor to one or more of Omega's wide variety of in-stock controllers, data loggers, transmitters, hand held thermometers, PLCs, or other measurement & control products to complete your measurement or control system. Omega offers a selection of programmable and fixed range transmitters that can be connected directly to the M12 connection of your PR-26 sensor. There are also wireless transmitter options available. Metal Parts: 316L Stainless Steel Sheath and Housing. Handle Accessory to Convert a PR-26A Probe Into a Hand-Held Probe. Note: For 1000 O, Class A elements, change “100” to “1000” in model number, no additional price. For lengths longer than 350mm, change “0350” in the model number to the required length in mm and add $1 per 25mm to the price. (example: 500mm = 0500, 425mm = 0425).